The emergence of the method of organic gardening has helped by offering an idea on some of the most common mistakes that the beginners make and the ones that can easily be avoided. There are many gardeners who do not pay attention to getting proper topsoil for plants and end up having sad flora that is not able to reach its full potential. There is another common blunder that gardeners make and that is not making the effective use of fertilizers when there are different renewable and natural sources available within the household. Apart from the use of insecticides and pesticides, there are different preventative measures and home remedies that can also be of good help in stopping the annoying dandelions from damaging an organic garden. Using topsoil in the most effective manner is quite essential for offering the plants a great start. Local gardening stores are filled with different varieties of organic soils that can easily be purchased. Generally speaking, topsoil is a substance rich in its content of nutrients and it also possesses the potential of holding moisture in good amount. All these different elements make use of material that is highly significant for the growth of plants from seeds and for the development of seedlings into strong roots. One of the greatest crop transformations takes place during the initial months. The topsoil offers the right nutrients that make way for the exponential growth of plants in the smoothest way possible. Topsoil can really help in making a great difference in your attempt of building a garden that possesses very few nutrients. Rich in its content of sand, silt, peat and various other materials, topsoil serves as an alternative to clay heavy and dry soil that does not assist the growth of plants. Fertilizers play an important role in organic gardening. Despite the fact that you have rich soil in the garden, the substances generally get absorbed with time and it becomes absolutely necessary to replace the nutrients. 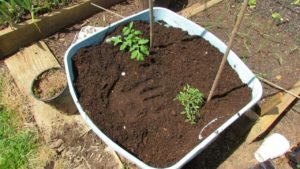 One of the best ways of using resourceful and eco-friendly procedures of offering nutrients to the soil is using leftover products in the house. For example, eggshells are quite rich in their content of nitrogen and calcium and they serve as the best food for plants. Discarded plant parts can also be broken into smaller parts and they can effectively be used for delivering nutrients. The droppings of farm animals like goats and rabbits can also be used in the form of fertilizer. This is considered one of the most effective and cheapest procedures of offering the plants with nutrients. Finally, taking safety and preventative measures for preventing invasive animals and plants from damaging your precious crops or plants serve as necessities for an organic garden. Preventative measures include the use of physical barriers like covering the plants in nets or vinyl sheets and keeping them in a fenced region. You must not allow your misinformed facts on organic gardening hinder you from succeeding in the production of healthy crops.